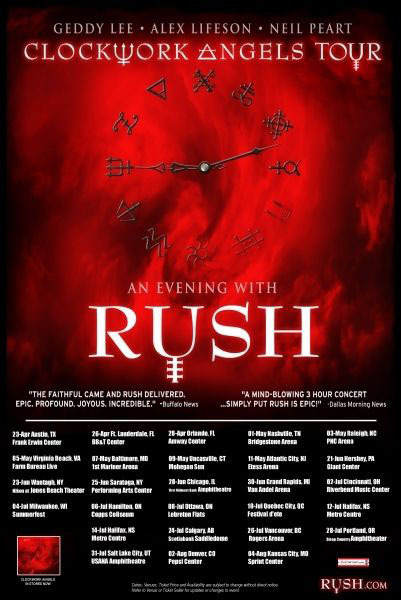 The Clockwork Angels tourdates have been announced at Rush.com. The complete Clockwork Angels tourdates can be found in my Tour Archive here (click tourdates under Clockwork Angels). 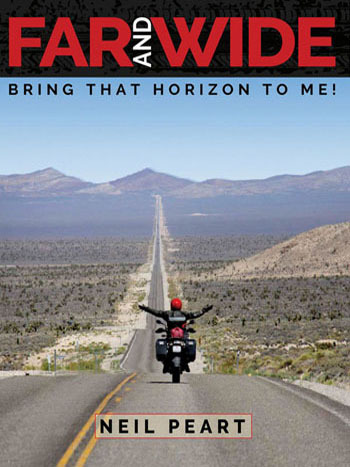 Click here for the tour trailer from Artisan News Service, "Rush Headlong Flight Into 2012 Tour, Talks Music Biz Advice." The June 2012 issue of MOJO magazine will be on newsstands shortly, and includes an 8 page feature on Rush. 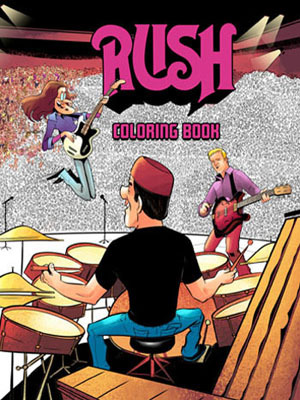 The cover includes the tagline "RUSH. Alienation. Weed. Epic Insanity! ", and MOJO.com gives the details "How the highbrow Canuck proggers fed on Tolkien, Ayn Rand, weed and whiskey, survived critics and personal tragedies to become 'the biggest cult band in the world.'". Although I haven't seen the final product yet, included in the story are tour posters and ticketstubs from the Power Windows "Tour Archive". - Thanks to Stephen Humphries for the headsup! VIP Nation's new policies state that one can buy a VIP package (that guarantees one a seat within the first 15 rows of a venue) through their website for around $300 USD but will not know one's actual seat until the day of the show. It is gathered from this new policy that this is to prevent resale of tickets to professional brokers who would then in turn make a huge profit at the band's expense. However, this is a huge gamble- one could ostensibly buy a VIP package and end up with a seat on the far aisle of the 15th row of an arena- a terrible view for the amount of money paid for it. This is quite different than the Time Machine Tour VIP packages that told one immediately where one's seat would be. This will not stand. It is assumed that these policies apply to all VIP ticket sales and were not created specifically for Rush fans. 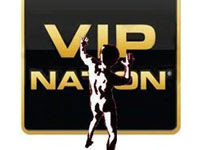 VIP Nation's frequently asked questions is available on their home page. 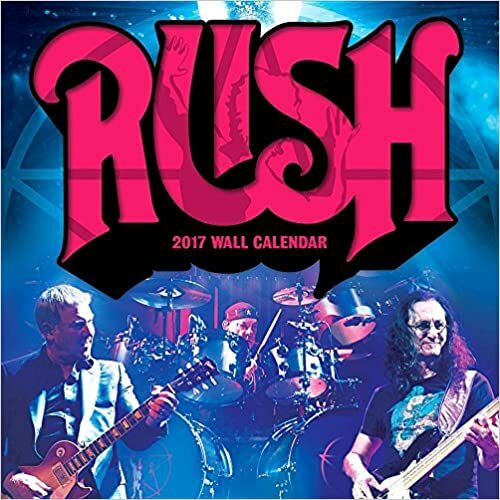 RushPetition.com is back for another tour, and is encouraging fans to pick their 5 favorite Rush songs from a list of songs that Rush have not played live in the last 20 years. Click here to vote! - Thanks to Skip Daly for the headsup! There was a Rush sighting on last Friday night's episode of Fringe. 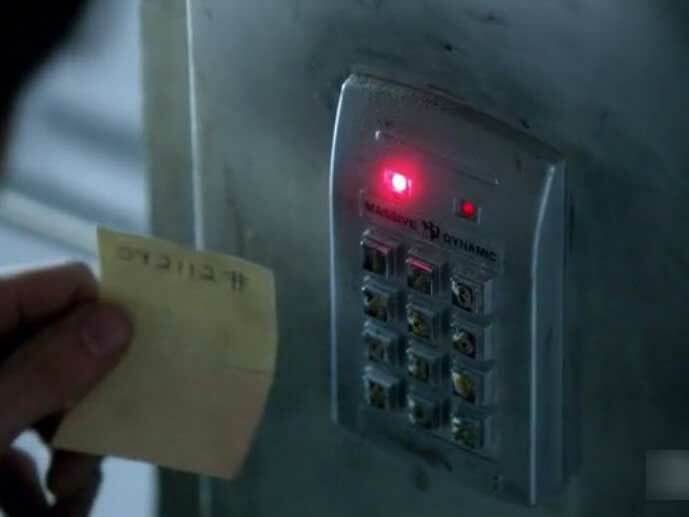 During the episode "Letters In Transit" (season 4, episode 19), guest star Henry Ian Cusick uses the password "092112#" written on a piece of paper to get into the "old" (alternate universe's) Massive Dynamic building. - Thanks to Bill Oross for the headsup! This is the second Rush reference on the popular Fox television program. Two years ago, during the episode "The Man from the Other Side" (season 2, episode 19), "Tom Sawyer" was heard on a car radio in opening scene. Headlong Flight is now available as a digital download via iTunes here as well as via CDUniverse should you desire an MP3 version. View "the official lyric video". The first round of Clockwork Angels Tour pre-sales start this Monday, April 23 for Manchester, Philadelphia, Newark, Brooklyn, Boston, Anaheim, Los Angeles, Buffalo, Chicago & Detroit. Be sure to register in advance at VIPNation. Additional pre-sale markets will be announced soon. Packages will be exclusive to Rush fan members for the first 24 hrs! We will also be offering an exclusive Clockwork Angels Tour hoodie, only available via this offer upon check-out. The Fan Club tickets are only available during the PRE-SALE. Reserve the best seats in the house through our special Rush fan pre-sales. These presales only last three days, and only certain cities/dates are currently available with more presales being added each week. Check back soon if you don’t see your date. 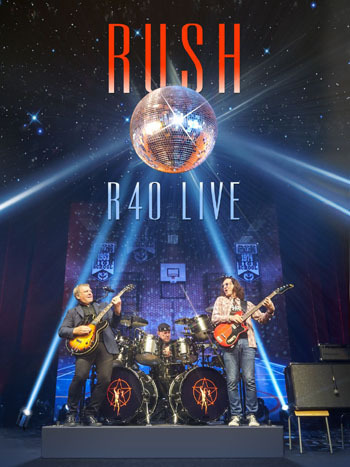 At the end of your ticket purchase, you will have the opportunity to pre-order Exclusive Rush.com Tour Merchandise. 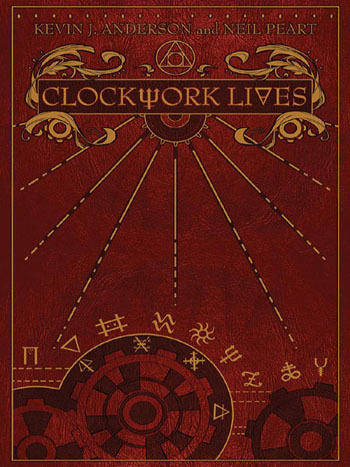 The Fan Club Presale Merchandise includes a BRAND NEW Clockwork Angels T-Shirt design. 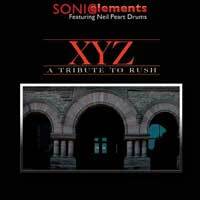 UPDATE April 21: The download version of Sonic Elements XYZ - A Tribute To Rush featuring Neil Peart Drums is now available from esoundz. 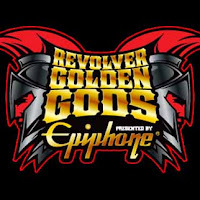 The CD version will be shipping soon. Sonic Reality's Neil Peart Drums is a sample library featuring recordings of Neil Peart playing the Snakes and Arrows’ Custom DW Drum Kit. The Sonic Elements project was put together by Sonic Reality CEO Dave Kerzner featuring various musicians from around the world playing classic rock covers and originals using the library samples. For more info, check out Everything You Wanted To Know About Sonic Reality's Neil Peart Drums: An Interview With Dave Kerzner by Andrew Olson. You can purchase the music on CD or download, or you can download Neil Peart Drums to do a virtual jam with him yourself! 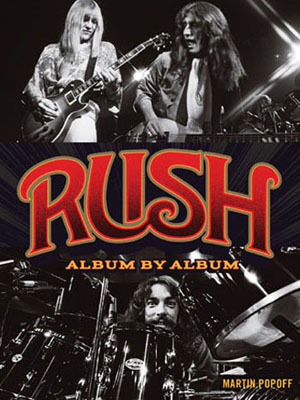 All is here: http://www.esoundz.com/neilpeartdrums (XYZ can be ordered at the bottom of the page). 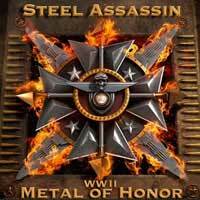 Steel Assassin's Cover "Red Sector A" on "WWII: Metal Of Honor"
"I actually made a demo of the song about five years ago basically for my own purposes. I've always loved the way Geddy (Lee) sings that song, there's a hopelessness and longing in his voice that is brilliant, but there's also a quality of urgency that I thought would translate well to metal, so I basically changed up the tempos and really kept everything else the same. I call Rush my 'desert island' band, meaning if I were ever stranded on desert island and could only listen to one artist, it would be Rush. Kevin and I are both huge fans all the way back to their earliest days. Their writing in a lot of ways is very metal, but they are so much more diverse than just that. 'Red Sector A' also ties in rather neatly with the military concept of our record. We were at my house combing through some demos for the new record, when I came across my old version of it, and all at once it struck me, this would be an awesome addition to the World War II theme. I began the campaign right then to have this song on the album, Kevin instantly agreed and the rest would follow. Lyrically and musically it's a perfect compliment to this record and the whole band is really excited about it." Thanks to Ed at RushIsABand.com for the headsup! "A rock legend recalls high times on and off the road, including the time our first issue inspired the creation of a legendary pot song." Toronto's NewsTalk 1010 Podcast: Donna Halper on "The Rock & Roll Hall of Lame"
Donna Halper was interviewed by Jim Richards of Toronto's News Talk 1010 this past Monday, April 16th. In the interview Donna shares how Rush have not been nominated because a couple of the judges don't like Rush. To download the podcast click here for Jim Richard's podcast page, and scroll down to "April 16 2012 Podcast". - Thanks to Frank Panacci for the headsup! Now that the album art has been officially announced, I have added three new images to the Rush Desktop Wallpaper album art page. Included are the Clockwork Angels cover, the new group photo, the Headlong Flight single cover, and in addition I've updated my "Rush Art Gallery" wallpaper which features every studio and live album arranged by release date. 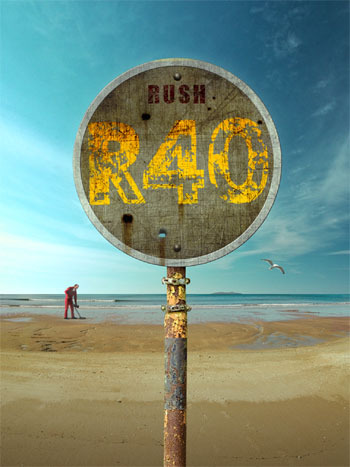 Rush grab their much deserved slot on our Top 100 Classic Rock Songs list with a track that found the band once again breaking new ground artistically. The unmistakeable sonic boom synthesizer intro of ‘Tom Sawyer’ launches side one of 1981’s landmark ‘Moving Pictures.’ Thanks largely to this song, the LP reached the top five of the Billboard album charts and would eventually become the band’s bestselling record. From the band’s perspective, every single second of ‘Tom Sawyer’ would be hard fought for in the studio as they worked to get things exactly right. What began — as it often does — as simple noodling at soundcheck evolved into a much more complex undertaking. Fortunately their efforts paid off and ‘Tom Sawyer’ was quite well received, to put it mildly. Geddy Lee featured in Fender Promo Video "2012 American Standard Series: Still the One"
Yesterday Fender posted a new video to Youtube to celebrate the 2012 American Standard series. Included are guitar and bass greats including Eric Johnson, Wayne Kramer, Chris Shiflett, James Burton, Justin Meldal-Johnsen, Nate Mendel, Marcus Miller, Geddy Lee and Billy Gibbons extolling the virtues of Fender's time-honored big four—the Stratocaster®, Telecaster®, Precision Bass® and Jazz Bass® guitars. - Thanks to Ed at RushIsABand for the headsup! 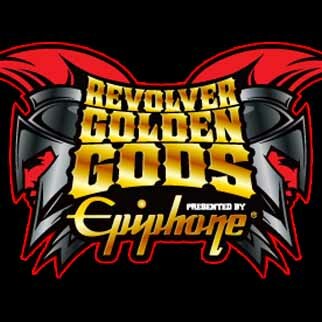 At Revolver Magazine’s Golden Gods Award ceremony Wednesday (April 11) night, Rush received the Ronnie James Dio Lifetime Achievement Award. Previous winners of the award were Ozzy Osbourne, Lemmy Kilmister and Motley Crue. After giving a plug to the Ronnie James Dio Stand Up and Shout Cancer Fund, Tenacious D presented the band in their typical style, with Kyle Gass and Jack Black trading lines of praise about the band. “For almost 40 years, this band has been blowing our minds and expanding everyone’s definition of rock,” Gass said. Drummer Neil Peart was the only member of the band on hand to accept the award. Bassist/vocalist Geddy Lee was in Japan, and guitarist Alex Lifeson, who Peart claimed is “the funniest man in the world,” was in Toronto. 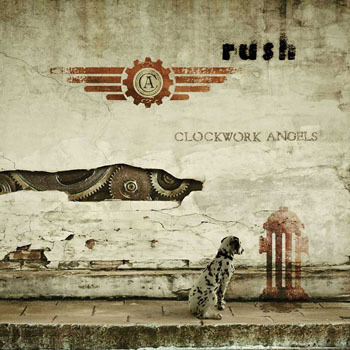 Rush has unveiled details of its highly anticipated, new album, “CLOCKWORK ANGELS.” This is the first new collection of original material in over five years and their first studio release via Anthem/Roadrunner records. “CLOCKWORK ANGELS,” the band’s 20th studio album, will be released on June 12th. 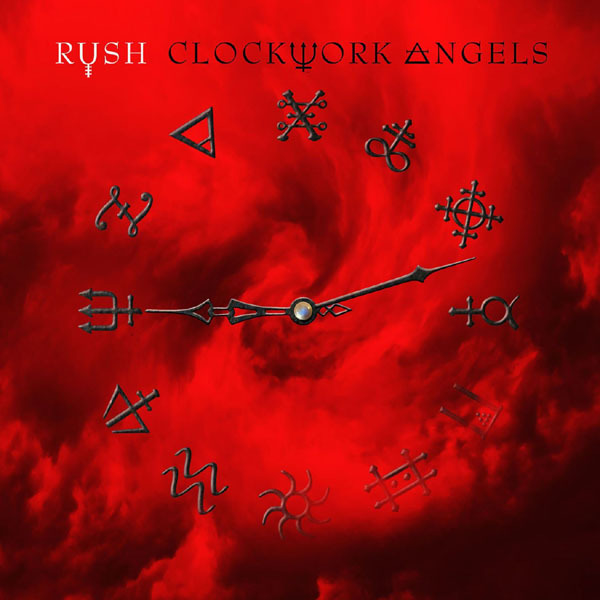 The recording of “CLOCKWORK ANGELS” began in April 2010 with Grammy Award winning producer Nick Raskulinecz (Foo Fighters, Deftones) – who also collaborated with the band on their last studio album, 2007’s “SNAKES & ARROWS.” Rush co-produced both records. The first two songs, “Caravan” and “BU2B,” were completed during that first session at Nashville’s Blackbird studios and performed nightly during the wildly successful Time Machine Tour, which ran from June 2010 to June 2011. Work on “CLOCKWORK ANGELS” resumed in the fall of 2011 at Revolution Recording in Toronto after the tour’s finale, with additional strings (arranged by David Campbell) recorded at Hollywood’s Ocean Way Studios earlier this year. Lyrically, “CLOCKWORK ANGELS” chronicles a young man’s quest across a lavish and colorful world of steampunk and alchemy as he attempts to follow his dreams. The story features lost cities, pirates, anarchists, an exotic carnival, and a rigid Watchmaker who imposes precision on every aspect of daily life. 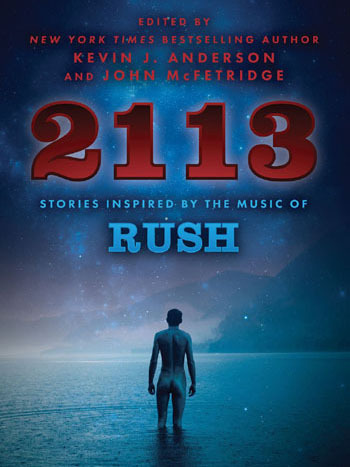 The novelization of “CLOCKWORK ANGELS” is being written by science fiction writer Kevin J. Anderson in collaboration with Rush drummer and lyricist Neil Peart. Although not yet announced, we have also learned that the album will be available on HDTracks.com in lossless 96kHz/24-bit FLAC. 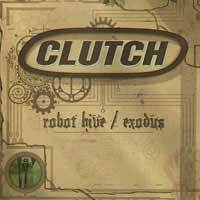 Time Machine 2011: Live In Cleveland Nominated for Juno "Music DVD Of The Year"
Time Machine 2011: Live In Cleveland was nominated for the 2012 Juno Award for "MUSIC DVD OF THE YEAR". Other nominees for the award included Feist: Look At What The Light Did Now, Tegan and Sara: Get Along, Peter Katz Live At The Music Gallery and David Francey: Burning Bright. The Juno Awards were held April 1st at Scotiabank Place in Ottawa, Ontario, and hosted by William Shatner who performed a medley of rock songs including Tom Sawyer (here's a video). Unfortunately, Rush did not win the Juno. Awarded March 31st during the pre-broadcast ceremony, the Music DVD of the Year Juno to Toronto's Leslie Feist for Feist: Look at What the Light Did Now. Temple of Syrinx having the bake sale of the year." 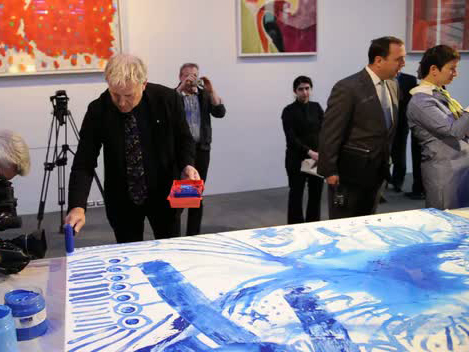 "It seems touring the world with one of the biggest rock groups of all time isn't enough for Rush guitarist Alex Lifeson as he splatters a canvas with blue paint. However Lifeson wasn't exhibiting a new creative direction for himself, rather he was taking part in a charity gala for The Kidney Foundation called 'Paint The Town Blue' in his native Canada. 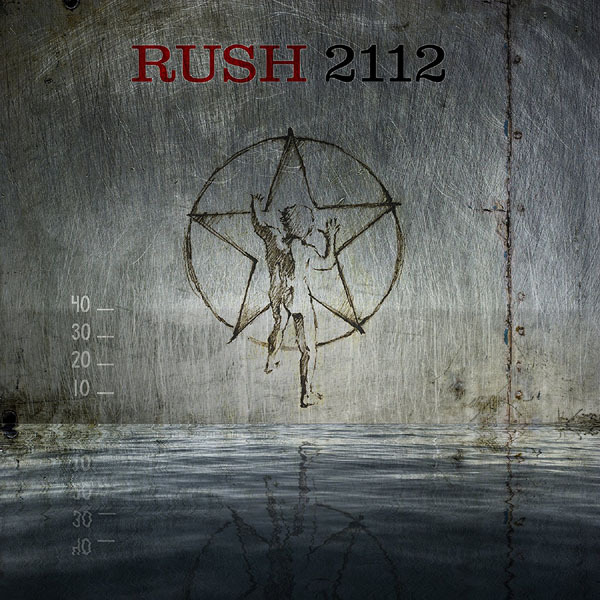 Finally, the album cover to Clockwork Angels, Rush's long awaited 19th studio album has been revealed/leaked. The image replicates the clock-face from the "Caravan" single, floating in a red storm background. The time on the clock is 9:12, or "2112" in military time. And as I've posted before, starting at the one o'clock position on the Clockwork Angels clock face, the symbols are Brimstone, Purification, Mercury, Winter, Zinc, Sun, Aquarius, Essence, Neptune, Lead, Earth, and Copper. In addition, the Clockwork Angels tour book cover has also been leaked, and it includes a dalmatian standing on a sidewalk staring at a red fire-hydrant painted on a the wall; through cracks in the wall clockworks are seen. - Thanks to MJZ and Ed at RushIsABand for the headsup! Rush To Appear On The Cover Of The Rolling Stone! - April Fools! UPDATE: I hope you all enjoyed our April Fool's joke! According to a source from Rolling Stone magazine, RUSH will finally appear on the cover of the Rolling Stone! 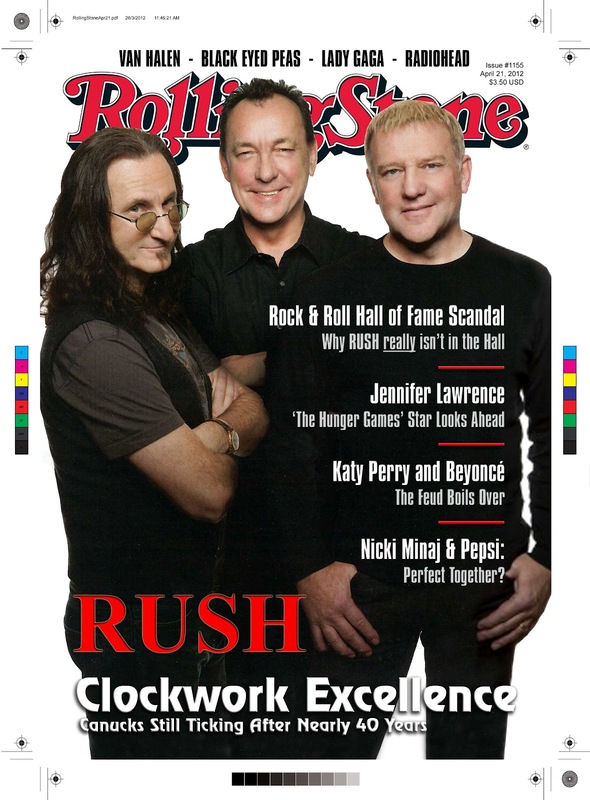 Still riding high on the popularity generated from Beyond The Lighted Stage and the Time Machine Tour, the magazine has taken this opportunity to showcase RUSH with their first ever cover feature in support of the release of Clockwork Angels. The magazine, which includes the feature story "Clockwork Excellence: Canucks Still Ticking After Nearly 40 Years", will also reportedly include an extensive collection of photos taken at Revolution Recording in Toronto, as well as a feature covering the band's history with the Rock and Roll Hall of Fame. The source confirmed that RUSH will be featured in the April 21st, 2012 issue, and provided this working copy of the cover (click here for a high resolution image) with the promise that that RollingStone.com will be updated soon with a story excerpt and photo gallery. RollingStone.com has added a brief excerpt of the cover story, "Clockwork Excellence", as well as this extensive photo gallery (click to enter). Although the Rolling Stone has not always appeared friendly towards RUSH, this trend began to turn when support for the band was provided in 2008 with their feature story "Rush Never Sleeps", and the followup online feature "Rush vs. Rolling Stone: A Qualitative Analysis". 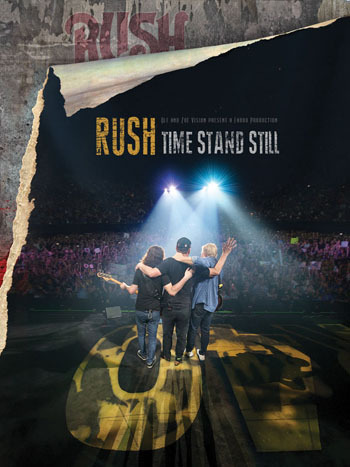 The Rolling Stone has also reached out to others in the Rush community to share the news, including Ed Stenger and John Patuto at RushIsABand.com and Cygnus-X1.net, leading me to believe that this is the start of the Clockwork Angels media storm which we will see over the next few months. Anthrax Recording Cover of Rush's "Anthem"
Anthrax are recording a cover of "Anthem" for an upcoming Rush tribute album. Yesterday Blabbermouth.com posted this video of drummer Charlie Benante laying down his drum track. No further details are available. - Thanks to Frank Ray for the headsup!